Bilecik is the provincial capital of Turkey's Bilecik Province. The population of the town is 62,320 (as of 2010). The mayor is Selim Yağcı (AKP). The town is famous for its numerous restored Turkish houses. It is increasingly becoming more attractive to tourists. With its rich architectural heritage, Bilecik is a member of the European Association of Historic Towns and Regions. 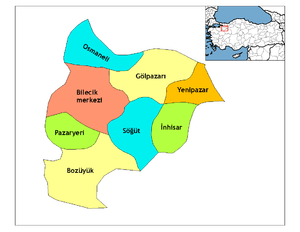 30 kilometres (19 miles) southeast from Bilecik is Söğüt, a small town, where the Ottoman Empire was founded in 1299. Bilecik has a mediterranean climate near the borderline of the continental climate with cold and often snowy winters and hot and dry summers. Summers are hot and dry with temperatures usually exceeding 30 °C (86 °F) in the height of summer, they are also the driest months. Winters are cold and it frequently snows a lot between the months of December and March. ↑ "İl ve İlçelerimize Ait İstatistiki Veriler- Meteoroloji Genel Müdürlüğü". Dmi.gov.tr. Archived from the original on 2013-01-17. Retrieved 2013-03-26. Wikimedia Commons has media related to Bilecik.